After 15 years in the kitchen I realize that many tools make my life soooo much easier. So here are my favorite things so far. This tool will grate your parmesan like light fluffy snow, it's perfect for zesting your citrus fruits and it's perfect for grating garlic right over your bowl or pot. Looooove them, they keep their edge and sharpness much longer than other knives. I have one knife and that's all I need, my 10" Victorinox. Never put your knives in the dishwasher treat them like your baby. It's just a must people but please throw wooden spoons away when they starts to splint or crack. I can not and will not live without these cast iron pots, they will follow me for the rest of my life. They are on the expensive side but if you treat them with respect, they can last you a lifetime. They call this style "La cocotte". I have two sizes small and large and I like the round shape over the oval shape. I use the small one for rice and different grains, soups and sauces and I use the large one to make delicious slow cooked stews, short ribs, spaghetti sauce and casserole's. I don't believe that you need to spend a lot of money for your every day pots. I have had my Lagostina pots for 13 years now and I don't think I will have to buy another set ever. I like that they have a glass lid so I can see when things are ready. They clean up beautifully in the dishwasher and heat up evenly. I may sound repetitive but again, I can't live without it. I have the Kitchen Aid brand but I also like the Cuisinart food processor. I make homemade hummus, muhammara and other dips, I grate a variety of cheeses to make my own blend, grate carrots for veggie burgers and salads, chop nuts and seeds and even make pasta dough and pie dough. If you are not a fast chopper or just don't like to use a knife much, this machine is for you and again, it will last forever if you treat it well. A variety of different size cutting boards can make your life much easier in the kitchen. Purchase ones that do not retain odor or bacteria. I have a variety of glass storage containers that can easily move from freezer to oven. Glass containers are much safer than tupperware and can be heated without worrying about harmful toxins leaching into your food. This little knife sharpener is great, I carry this knife sharpener around with me everywhere I go. You never know when your going to have to sharpen someone's knife! 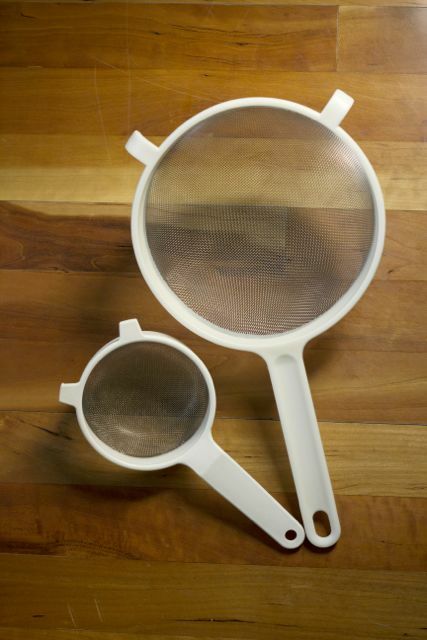 These fine strainers are great for rinsing little grains like quinoa or red lentils. They are super handy when making your own yogurt cheese or even sifting flour for baking. A well seasoned cast iron pan will last a lifetime. Never wash the with soap and make sure to dry them on the stove top or in a warm oven after washing. Cast iron pans are great for searing meat and homemade corn bread. Steaming your food is the healthiest cooking method if you learn to cook your vegetables until just tender and not soft. 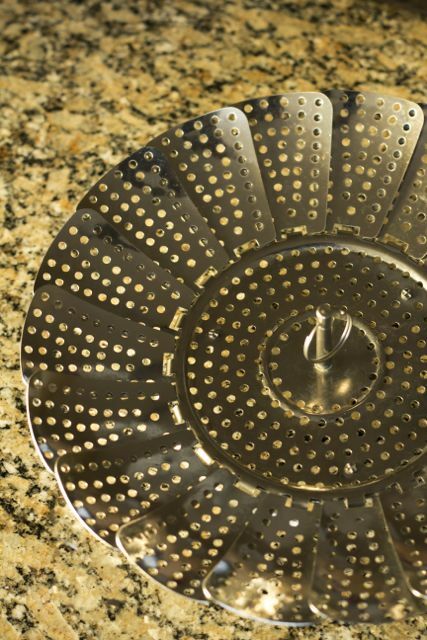 This steam basket can fit into a small or large pot depending on how much food you are steaming. These rubber spatulas are handy to get out that last bit of natural organic peanut butter, dijon mustard and raw honey. They are great for baking and even a must have!